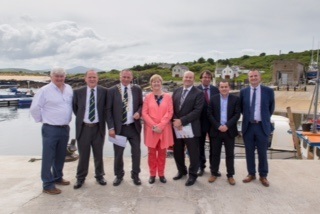 The sun came out to greet special guests and locals alike on Friday afternoon for the official opening of the new Bunagee Marine Development at Culdaff by Joe McHugh TD Minister of State for the Diaspora and International Development. Bunagee Pier was a sight to behold as over 100 people gathered along the pier and the new pontoon to celebrate it's official opening. Speaking at the event local councillor and chair of the Inishowen Municipal District Cllr Bernard McGuinness congratulated all those involved in making this development a reality and paid special tribute to the local community.He said that this day had been a long time coming and he was delighted to see such a wonderful facility being made available in this area.He talked about the history of the pier and what it meant to the local community and particularly to the local fishermen.He acknowledged the work done by the Department of the Marine in upgrading the new pier facilities which have been warmly welcomed the local fishermen. The new Bunagee Marine Development includes the development of a safe haven including a breakwater and pontoons to accommodate up to 15 vessels at the Pier and was developed by Donegal County Council as part of a major cross border and transnational project known as Sail West and involved 21 partners from Ireland, Northern Ireland and the West Coast of Scotland. The project cost just under €1.3million and was funded by the European Union’s INTERREG IVA Cross-border Programme managed by the Special EU Programmes Body.The project was constructed by Deane Public Works and Doran Consulting was awarded the contract as the Consultant Engineers. In his address Cllr Terence Slowey Cathaoirleach of Donegal County Council said that the infrastructure now available at Bunagee is a major boost for the development of the marine tourism sector not only in Inishowen but for the entire county. The Bunagee Marine Development was constructed as part of the wider Sail West project which saw the emergence of the well known MalinWaters brand in 2010. Garry Martin, Director of Service in Donegal County Council and chair of the SailWest Initiative also spoke at the opening.He recalled how the project was developed from initial concept stage over nine years ago to the development in place today along with the Malinwaters marketing brand that is seeing Donegal gain significant traction in this competitive but high yield market.Garry Martin acknowledged all those involved in the project since its inception and had a special mention for the funders without whom the project would not have been possible. In his address Minister of State Joe McHugh referred to the areas strong link with Scotland and indeed to the important role played by partners from Scotland in securing funding for this initiative and for the ongoing cooperation in the MalinWaters marketing initiative.He urged local Councillors to continue to build on these linkages and to reach out to the Donegal community not only in Scotland but across the globe.He said that these connections would continue to be mutually beneficial for all concerned and that it is important that these relationships are nurtured and built upon as it is through these type of connections that opportunities for growth and development are created. Deputy Charlie McConalogue TD also spoke at the event which was chaired by Liam Ward, Director of Service with Donegal County Council. The event concluded with a visit to one of a number of boats currently moored at the pontoon and an invite was extended to all to McCrory's in Culdaff for light refreshments.